Nat Genet 2012 44(8):852-60. Erlotinib HCl (OSI-744) purchased from Selleck. J Clin Invest 2012 122, 3197-210. Erlotinib HCl (OSI-744) purchased from Selleck. Effects of combined treatment with erlotinib and NPS-1034 in HCC827/ER cells with AXL activation. Lysates were immunoprecipitated with an anti-AXL antibody and immunoblotted with antibodies for phosphotyrosine (p-Tyr) and AXL. HCC827/ER cells were treated with erlotinib. E, erlotinib; N, NPS-1034. **, P < 0.001 for the combination of erlotinib plus NPS-1034 versus either the control or drug alone. Cancer Res 2014 4(1):253-62. Erlotinib HCl (OSI-744) purchased from Selleck. Immunoblots of MCF7-HER2 cells treated with DMSO (c), BEZ235 (B, 500 nM) and lapatinib (L, 500 nM) as well as with erlotinib (E, 500 nM) and the indicated combinations for 24 h.
Oncogene 2010 30, 2547-2557. Erlotinib HCl (OSI-744) purchased from Selleck. (B–C) LNCaP (B) and LNCaP-AI (C) cells were transiently transfected with sPLA2-IIa(-800)-Luc (0.5 μg). The cells were then treated with Erlotinib (20 μM), Gefitinib (20 μM), Lapatinib (20 μM), CI-1033 (8 μM), LY294002 (20 μM) and Bortezomib (20 μM) without or with EGF (100 ng/ml) for 24 h. Luciferase assay was performed according to a standard protocol with Renilla luciferase as an internal control. Data are presented as the mean (±SD) of duplicate values of a representative experiment that was independently repeated for five times. Carcinogenesis 2010 31, 1948–1955. Erlotinib HCl (OSI-744) purchased from Selleck. LNCaP-AI cells were starved in 1% stripped medium for 24 h. The cells were then treated with Erlotinib (20 μM), Gefitinib (20 μM), Lapatinib (20 μM), CI-1033 (8 μM), LY294002 (20 μM) and Bortezomib (20 μM) for 24 h. Cell culture medium was collected from each sample and subjected to ELISA for sPLA2-IIa. The condition medium samples were diluted 10 times for ELISA. Average of duplicate samples was converted to nanogram per milliliter against standard curve. The data represent one of five repeated experiments. Susceptibility of lung cancer cells to cytolytic activity of NK-92 cells after treatment with EGFR inhibitors. Three lung cancer cells were untreated (open circle) or treated with 10 μM erlotinib or gefitinib (black filled square or black filled triangle) for 24 hours. The lung cancer cells were cocultured with NK-92 cells at indicated effector to target ratio (E:T ratio). To determine the specificity of NKG2D-mediated cytolysis of lung cancer cells, NK-92 cells were preincubated with blocking mAb against NKG2D before the assay (gray filled square and triangle) and correspond-ing isotype mAb (open square and triangle). J Immunother 2011 34, 372-81. Erlotinib HCl (OSI-744) purchased from Selleck. Transl Oncol 2011 4, 92-100. Erlotinib HCl (OSI-744) purchased from Selleck. miR-17-5p is down-regulated by erlotinib treatment in A549-ER cells. (A) MTT was used to assess cell viability of A549 and A549-ER cells after 72-h erlotinib treatment with different concentrations. (B) Real-time PCR quantification of indicated miRNAs. (C) Real-time PCR quantification of miR-17-5p in A549 cells treated with erlotinib at indicated concentrations for 48 h. For all, *p < 0.05, **p < 0.01, ***p < 0.001versus control group. J Drug Target, 2016, 25(2):125-131. Erlotinib HCl (OSI-744) purchased from Selleck. Microvasc Res 2010 81, 135-142. Erlotinib HCl (OSI-744) purchased from Selleck. PAS staining and Masson's trichrome staining of kidneys in 22-week-old vehicleor erlotinib-treated AS mice. Clin Exp Nephrol, 2017, 21(6):952-960. Erlotinib HCl (OSI-744) purchased from Selleck. Tuberc Respir Dis 2013 75(1), 9-17. Erlotinib HCl (OSI-744) purchased from Selleck. Erlotinib and picropodophyllin (PPP) act together to reduce cell proliferation. MET1 cells were cultured for 48 hours in increasing concentrations of erlotinib (A) or PPP (B) as indicated. Cell growth was then assessed using methyl thiazolyl-tetrazolium (MTT) assays. A dose-dependent decrease in the number of viable cells is seen with rising inhibitor concentrations (n = 3 at all time points). MET1 cells (C), MET4 cells (D), SCC12 cells (E), and SCC13 cells (F) were cultured for 48 hours in varying concentrations of erlotinib and PPP as indicated. Cell growth was then assayed with MTT assays. Both erlotinib and PPP demonstrated dose-dependent inhibition of cell growth, and at intermediate concentrations there seemed to be synergistic prevention of cell growth by both inhibitors. Higher concentrations of all inhibitors were also tested but are not shown as they exceeded the maximal responses of the cells to the inhibitors. Head Neck 2013 35, 86-93. Erlotinib HCl (OSI-744) purchased from Selleck. Inhibition of anchorage-independent growth of lung tumor cell lines by selected inhibitors. Each selected cell line was treated with the indicated inhibitor at 0.1 μM and 1 μM concentrations for two weeks and cell colony size formation was scored under the Nikon inverted-phase microscope. Int J Proteomics 2011 2011, Article ID 215496. Erlotinib HCl (OSI-744) purchased from Selleck. DUSP6 is regulated by EGFR/ERK inhibition in NSCLC cell lines. Protein expression levels were assayed by immunoblot for phosphor-EGFR at indicated tyrosine sites, total-EGFR, phosphor-ERK, total-ERK, ETS1, DUSP6 and GAPDH demonstrating suppression of DUSP6 following inhibition of activated ERK (P-ERK) and ETS1 levels in the presence of appropriate drug for each of the following cell lines: (a) HCC827 cells treated with erlotinib; (b) H1975 cells treated with erlotinib or CL-387,785 (an irreversible EGFR inhibitor); H441 cells treated with (c) erlotinib or U0126 (a MEK1/2 inhibitor) and (d) erlotinib or AG1478 (specific EGFR inhibitor) (d). Cells were starved overnight with serum-free media, then treated with drug as indicated by the following abbreviations: (E) 100ng/ml EGF; (D) 0.01% DMSO control; (Er) 1 μM erlotinib, (CL) 1 μM CL-387,785, (U) 20 μM U0126 or AG1478. Whole cell lysates were obtained using 10% TCA lysis buffer and immunoblotting was performed at indicated time points. 2010 Dr. Balazs Halmos of Columbia University. Erlotinib HCl (OSI-744) purchased from Selleck. DUSP6 gene expression is inhibited by erlotinib using quantitative real-time PCR analysis. RNA was extracted from treated (a) HCC827 and (b) PC9 cells and relative expression level standardized against GAPDH at several time points. Breast cancer cells were pretreated with 100ng/ml EGF for 15 min and then treated with the indicated concentrations of Erlotinib for 24 hours. 2010 Dr. Zhang of Tianjin Medical University. Erlotinib HCl (OSI-744) purchased from Selleck. 96-well plates are coated by incubation overnight at 37 °C with 100 μL per well of 0.25 mg/mL PGT in PBS. Excess PGT is removed by aspiration, and the plate is washed 3 times with washing buffer (0.1% Tween 20 in PBS). The kinase reaction is performed in 50 μL of 50 mM HEPES (pH 7.3), containing 125 mM sodium chloride, 24 mM magnesium chloride, 0.1 mM sodium orthovanadate, 20 μM ATP, 1.6 μg/mL EGF, and 15 ng of EGFR, affinity purified from A431 cell membranes. Erlotinib HCl in DMSO is added to give a final DMSO concentration of 2.5%. Phosphorylation is initiated by addition of ATP and proceeded for 8 minutes at room temperature, with constant shaking. The kinase reaction is terminated by aspiration of the reaction mixture and is washed 4 times with washing buffer. Phosphorylated PGT is measured by 25 minutes of incubation with 50 μL per well HRP-conjugated PY54 antiphosphotyrosine antibody, diluted to 0.2 μg/mL in blocking buffer (3% BSA and 0.05% Tween 20 in PBS). Antibody is removed by aspiration, and the plate is washed 4 times with washing buffer. The colonmetric signal is developed by addition of TMB Microwell Peroxidase Substrate, 50μL per well, and stopped by the addition of 0.09 M sulfuric acid, 50 μL per well. Phosphotyrosine is estimated by measurement of absorbance at 450 nm. The signal for controls is typically 0.6-1.2 absorbance units, with essentially no back ground in wells without AlP, EGFR, or PGT and is proportional to the time of incubation for 10 minutes. Method: Exponentially growing cells are seeded in 96-well plastic plates and exposed to serial dilutions of erlotinib, pemetrexed, or the combination at a constant concentration ratio of 4:1 in triplicates for 72 h. Cell viability is assayed by cell count and the 3-(4,5-dimethylthiazol-2-yl)-2,5-diphenyltetrazolium bromide assay. Growth inhibition is expressed as the percentage of surviving cells in drug-treated versus PBS-treated control cells (which is considered as 100% viability). 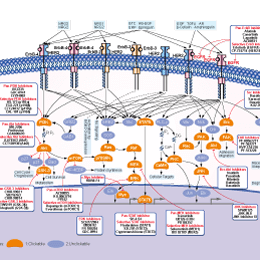 The IC50 value is the concentration resulting in 50% cell growth inhibition by a 72-h exposure to drug(s) compared with untreated control cells and is calculated by the CalcuSyn software. Moyer JD, et al. Cancer Res. 1997, 57(21), 4838-4848. Li T, et al. Clin Cancer Res, 2007, 13(11), 3413-3422. Ali S, et al. Mol Cancer Ther, 2008, 7(6), 1708-1719. Buck E, et al. Mol Cancer Ther. 2006, 5(11), 2676-2784. Higgins B, et al. Anticancer Drugs. 2004, (5), 503-512. Furugaki K,et al. Oncol Lett. 2010, 1(2), 231-235. Whether S1023 is suitable for mouse assays? Dissolving S1023 in 15% Captisol is for oral gavage and it's a suspension. 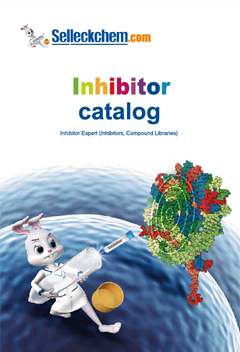 AZD8931 (Sapitinib) : Pan-ErbB inhibitor, EGFR/ErbB2/ErbB3, IC50=4 nM/3 nM/4 nM. Afatinib (BIBW2992) : EGFR(wt), IC50=0.5 nM; EGFR(L858R), IC50=0.4 nM; EGFR(L858R/T790M), IC50=10 nM; HER2, IC50=14 nM. CO-1686 (AVL-301) New : Irreversible, mutant-selective EGFR inhibitor with Ki of 21.5 nM and 303.3 nM for EGFRL858R/T790M and EGFRWT, respectively. AG-1478 (Tyrphostin AG-1478) is a selective EGFR inhibitor with IC50 of 3 nM in cell-free assays, almost no activity on HER2-Neu, PDGFR, Trk, Bcr-Abl and InsR.